Most of the time we devise strategies in the default mode of problem-solving, prioritizing maximum growth and profit through rational and logical analysis. But we already know that rational and logical analysis doesn’t always result in the best decisions. The ideal is to turn strategy work into a rigorous discipline with the use of deductive logic, a well-structured hypothesis, and a thorough collection of evidence and data. Such problem solving has dominated most research and teaching in business schools over the last decades and has formed the guiding principles of many global management consultancies. Slowly but steadily, this mind-set has gained dominance in business culture over the last thirty years. Today it is the unspoken default tool for solving all problems. This mindset is almost scientific in the quest for precision. … learn from past examples to create a hypothesis you can test with numbers. As it uses inductive reasoning for its foundation, it is enormously successful at analyzing information extrapolated from a known set of data from the past. Default thinking helps us create efficiencies, optimize resources, balance product portfolios, increase productivity, invest in markets with the shortest and biggest payback , cut operational complexity, and generally get more bang for the buck. In short, it works extraordinarily well when the business challenge demands an increase in the productivity of a system. But this method often falls short. And one area where it falls short is people’s behaviour. “When it comes to cultural shifts, the use of a hypothesis based on past examples will give us a false sense of confidence, sending us astray into unknown waters with the wrong map,” the authors write. Certain problems benefit from a linear and rational approach, while other, less straightforward challenges—navigating in a fog—benefit from the problem solving utilized in the human sciences like philosophy, history, the arts, and anthropology. We call this problem-solving method sensemaking. Sensemaking is really about finding how things are experienced through culture. The hard sciences involving mathematics and universal laws tell us the way things are and tend to take the main spotlight when we discuss our understanding of the world. This tendency is so common, we often disregard the wide range of sciences that are used to shed light on other phenomena, or the way things are experienced in culture. If default thinking shows us what exists in the foreground (e.g., “we are losing our market share in competitive athletic apparel”), the human sciences investigate the invisible background— the layered nuance behind what we perceive (e.g., “well -being, not competition , is the main motivating factor for many people participating in sports”). How we experience the world may be as important as, or more important than the hard, objective facts about the world. This is especially true for the specific set of problems where past data or scenarios no longer seem relevant. Default thinking and sensemaking are complementary tools. How default thinking and sensemaking complement one another. But we tend to see leadership more in the default thinking way, which makes perfect sense. Who doesn’t want to be hypothesis driven, quantitative, and linear in their approach to solving problems? Most of these things are visible, which has an added benefit too. But if this is the only tool in our toolbox we’re going to fall short. 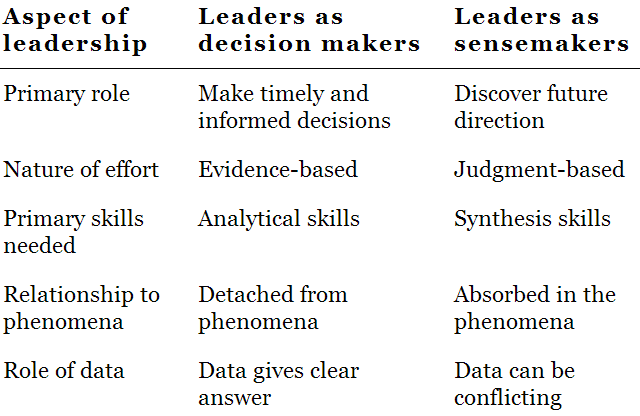 The difference between decision makers and sensemakers. It was perfectly rational, yet wrong, for the steel companies in The Innovator’s Dilemma to cede low-margin market share to the mini-mills. This is the decision we’d all make if we look at it through the lens of finance and default thinking. In my interview with Forbes last year, I elaborated on this concept as well with the example of a textile company. It’s only when you approach problems through different lenses that you can solve them. The Moment of Clarity: Using the Human Sciences to Solve Your Toughest Business Problems goes on to explain how humanities help solved some of our toughest business problems.